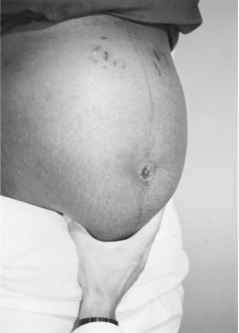 Subsequent antenatal examinations are important for screening for impaired fetal growth, malpresentation, anemia, preeclampsia, and other problems. In the absence of specific complaints by the patient or of abnormal findings on the initial examination or initial laboratory and sonographic studies, only a few parts of the physical examination just outlined are routinely performed during each visit. These include weight, blood pressure, and examination of the abdomen. This section concerns the abdominal examination. The physical examination should confirm that fetal growth is consistent with gestational age. Attention should then be given to assessing the lie and presentation of the fetus. From the 28th week of gestation to term, the following four maneuvers, known as Leopold's maneuvers, provide vital information for the examiner about these important questions. The patient lies supine for these maneuvers. The first maneuver is used to evaluate the upper pole and defines the fetal part in the fundus of the uterus. Stand facing the patient at her side, and gently palpate the upper uterine fundus with your fingers to ascertain which fetal pole is present. This technique is demonstrated in Figure 23-14. Usually, the fetal buttocks are felt at the upper pole. They feel firm but irregular. In a breech presentation, the head is at the upper pole. The head feels hard and round and is usually movable. The second maneuver is used to locate the position of the fetal back. Standing in the same place as in the first maneuver, place the palms of your hands on either side of her abdomen, and apply gentle pressure to the uterus to identify the fetal back and limbs, as shown in Figure 23-15. On one side, the fetal back is felt: rounded, smooth, and hard. 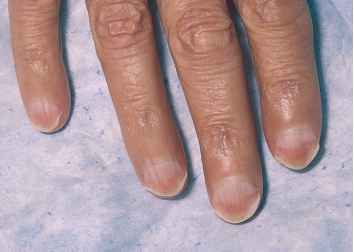 On the other side are the limbs, which are nodular or bumpy, and kicking may be felt. The third maneuver is to palpate the lower pole of the fetus. From the same position as in the first two maneuvers, use your thumb and fingers of one hand to grasp the lower portion of the maternal abdomen just above the symphysis pubis. This maneuver is illustrated in Figure 23-16. If the presenting portion is not engaged, a movable part, usually the head of the fetus, is felt. 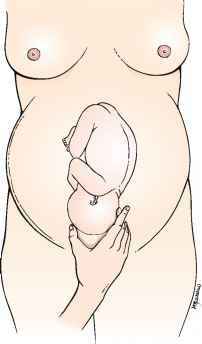 If the presenting portion is engaged, this maneuver indicates that the lower pole of the fetus is fixed in the pelvis. Figure 23-15 Leopold's second maneuver. A, Position of clinician's hands on mother's abdomen. B, Illustration of relationship of clinician's hands and fetus. Figure 23-16 Leopold's third maneuver. Relationship of clinician's hand and fetal presenting part. A, Position of clinician's hand on mother's abdomen. B, Illustration of relationship of clinician's hand and fetus. her feet. Place your hands on either side of her lower abdomen. With the tips of your fingers, exert a deep pressure in the direction of the pelvic inlet, as indicated in Figure 23-17. If the presenting portion is the head and the head is flexed normally, one hand will be stopped by the cephalic prominence as the other hand descends farther down on the pelvis. In a vertex presentation, the cephalic prominence is on the same side as the fetal small parts. In a vertex presentation with the head extended, the prominence is on the side of the back. Labor is the process of birth. The diagnosis and the mechanism of labor are complex topics and are beyond the scope of this book. 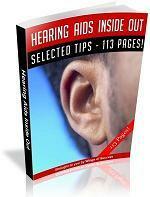 The reader is referred to the references at the end of this chapter for discussions of these topics.